Babies have a relatively large head, compared to the rest of the body. The neck muscles are not that strong yet, their brains and blood vessels are also very vulnerable. If a baby or a small child is shaken in such a way that the head moves back and forth separately from the body, it can cause very serious damage to the blood vessels, the brain and to the nerves in the neck and brain regions. This creates shaken baby syndrome (SBS). It is still too often thought that only brute force is the cause of SBS. Research in America has shown that in many cases SBS was not about serious abuse. If the parents do not admit to it, then there are several complaints that could indicate maltreatment in the region of the head. The pediatrician will ask questions to the parents on this basis and continue to examine the baby. Indications may include: swelling in the brain, bleeding in the brain, contusions in the brain and / or skull, bruises in the neck, bleeding in both eyes. The permanent damage that children suffer from extreme shaking varies from mild complaints (eg concentration problems), to death in the worst case. A baby with SBS can NOT be cured, the damage that has been done is permanent. If you suspect that your baby has been shaken by another, go immediately to the hospital's first aid. Even if you have shaken up the baby, it is really best to go to the hospital as soon as possible with the baby and tell them honestly what happened. It is possible that rapid help for the baby can prevent serious damage. Therefore, do not let shame and fear of what can happen prevent you from going to the hospital. Not all hospitals immediately switch to child protection. It is important to note that there is open and honest discussion about what exactly happened. Also work in all possible ways. If the doctors suspect child abuse and the parents do not cooperate, the child protection will always be contacted. Do not assume that it might all be bad with the baby, if at first there seems nothing wrong. It is quite possible that, for example, a bleeding has already occurred in the brain. Possibly a swelling may have already occurred. About 50 percent of babies with SBS die after being severely shaken. If the baby receives medical help in the hospital as soon as possible, this can be prevented in part. It may now be clear that SBS is very serious. Yet it can be prevented 100 percent. 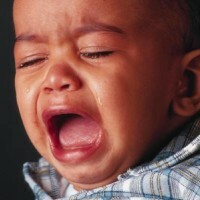 A baby can cry 2 to 3 hours a day. A parent can get annoyed by this, causing feelings of rage and sometimes a parent can lose his / her self-control. Stay away from the baby if you are irritated. Do not pick up the baby. Just sit outside and count if necessary 10 times to 100. If you are really afraid that you want to do something violent, call a friend, for example, or ask if the neighbor wants to come. You can always turn to outside help, this is much more preferable to any infuriated alternative. Studies show that 60 percent of perpetrators are males in their early 20s.